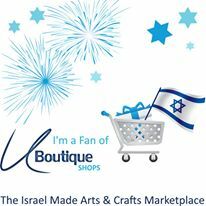 U-Boutique is passionate about connecting talented, independent Israeli artists with lovers of quality, original judaica jewish art, jewelry, fashion & gifts. We empower buyers to easily browse a huge selection of unique work and connect them directly with the artists and designers who express the Israeli and Jewish spirit. Visit U-Boutique's profile on Pinterest.